Pra Kring Pim Pid Ta Kru Klong Takian Wat Pradoo Song Tam (Nork Pim) - A highly unusual and extremely rare Pra Pid Ta amulet, of which only very few ere found, and which are hardly documented, making them 'Nork Pim' (Unusual Models). The Pra Pid Ta is made from Nuea Din Pasom Pong Bailan, and possesses the classic features present within the Muan Sarn Sacred Powders of the Pra Dtragun Kru Klong Takian Pantheon of amulets of this Hiding Place find. 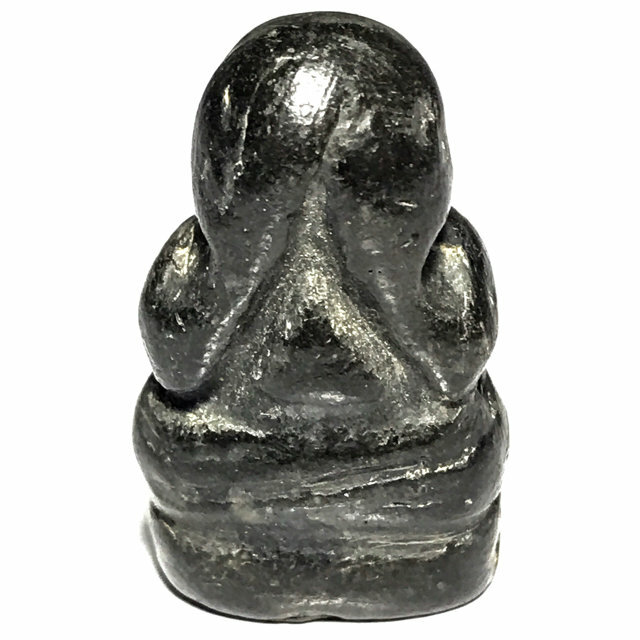 This Pra Nork Pim Unusual Rare Model has a Chanuan Kriing Bead which rattles when shaken, which is commonly found in many exhibits of Pra Kru Klong Takian amulets, and which is renowned for Kong Grapan Chadtri Klaew Klaad Invincibility and Protective Blessings, and Keeping Away Illnesses and Evil Spirits. In the time around the year 2460 BE, people digging around the banks of the Klong Takian canal began to find various kinds of amulets in the various temples of the municipality of Klong Takian, including Wat Klong Takian, Wat Pradoo Song Tam, Wat Koke, Wat Chang, Wat Pichai Each temple seems to have had certain Pim (models), which were particular to the temple, such as the Pra Pid Ta Pichai Kru Klong Takian, found at Wat Pradoo Song Tam. The amulets were found in a large number of different forms, some in large numbers, other models in very small numbers, which are very rare to encounter, as well as some individual items which did not fit into any general classification (Nork Pim). Some amulets possess a Kring Bead within the amulets,some of which rattle when shaken. The amulets were found made in Din Phao baked clay, and in Din Pasom Pong Bailan Sacred earths with Black Parchment Grimoire Soot. Some devotees say that this came from the ashes of funerals of Phii Dtaay Hoeng Prai Ghosts, who died on a Saturday and who were born on a Tuesday. The most famous and highly esteemed of all the Pra Kru Klong Takian amulets, is the Pra Pid Ta Pichai of Wat Pradoo Song Tam, and the Pra Kring Klong Takian Pim Nakprok, of Wat Pradoo Song Tam. The Pra Pid Ta Pichai was found in one sided, two sided and even four sided models. The Pra Kring Klong Takian Prok Po was found in one and two sided models, The One sided models have a sacred Yantra Inscription on the rear face. Wat Pradoo Song Tam, is an Ancient Temple of the Ayuttaya Era, which has always been a Revered Temple of the great Kings and Royal Personages of the Late Ayuttaya Era, and into the Ratanakosin Era. The amulets which were found in this temple enclave are honed in the architectural artistic style of the Northern Influence, such as the Pra Rod (Lampun), Pra Kong (Lampun), the Pra Ler, and the Pra Liang. 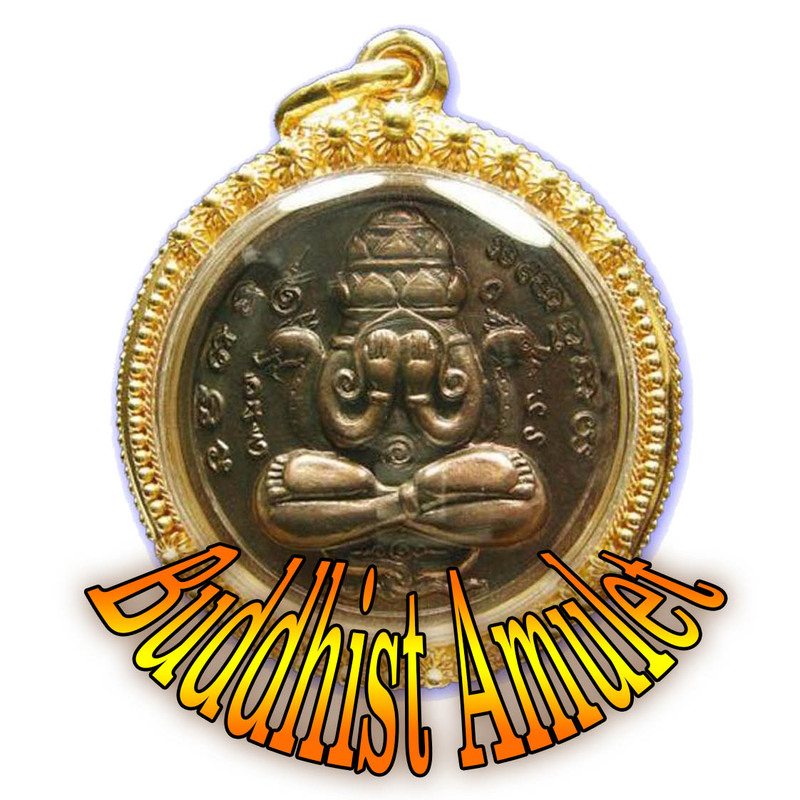 If we examine the various Pim, such as the Pra Prok Po Kring Klong Takian, we can see similarity to the Pra Kong Lampoon amulet, despite a higher arched outer shape, the actual Buddha image has the 'Met Khai Pla' rounded bobble style of Bodhi Leaves cascading over the Buddha, much like the artistic styling of the Pra Kong Lampoon, which is over 700 years Old. This reveals the Northern Lanna Influence on the design of the amulets, and also, through design, hints at the fact that this find of amulets, discovered in the year 2460 BE, is centuries old. There is also a different belief in the origins of the Kru Klong Takian amulet find, which is the belief that Khrua Rod (Luang Phu Rod), the famous Master of Were-Tiger Transformations made the amulets. Luang Phu Rod was known to have been a part time resident of Wat Pradoo Song Tam in Olden Days, who traveled down on Tudong from the Northern Lanna Regions, to reside at Wat Pradoo Song Tam. When Ayuttaya fell, Luang Phu Rod is said to have disappeared, until the situation improved, whereupon he returned to Wat Pradoo Song Tam, and remained until his passing. It is believed that Luang Phu Rod created the amulets. This group of believers are of the belief, that Luang Phu Rod created the amulets in the style of the Northern Tradition, to distribute to the soldiers who were fighting the Burmese Invaders, to bring them Kong Grapan Chadtri Klaew Klaad Maha Amnaj Magical Protection. 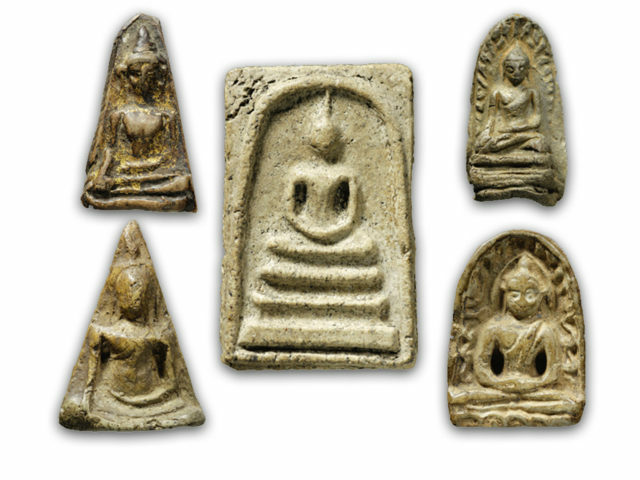 Whichever of these beliuefs is true, what is certain, is that the Pra Kru Klong Takian amulets, date from before the end of the Ayuttaya Period, and derive from a time when the most powerful Masters walked the forests and wildernesses of Thailand, and the most sacred Blessings, and Powerful Sorcery of that Era, is present within the amulets. One of the most famous and accepted pantheons of the Pra Kru Category of Pra Niyom master-Class amulets in History, and an Eminent Member of the Tamniab Pra Niyom of the Samakom Pra Krueang Thai appreciation societies.